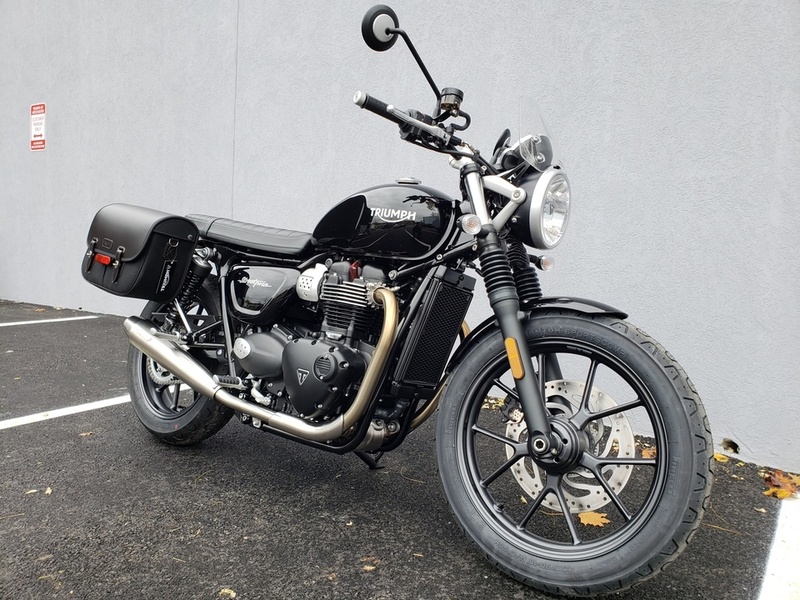 THIS 2018 TRIUMPH BONNEVILLE STREET TWIN IN JET BLACK IS IN NEW CONDITION WITH NO MILES ON IT. ALL TRIUMPH INCENTIVES REFLECTED IN PRICE. LIMITED TIME OFFER. BIKE COMES WITH TWO YEAR UNLIMITED MILE FACTORY WARRANTY. FINANCING FOR ALMOST ANYONE! ALL TRADES WELCOME! PLEASE CALL 914-358-1154 TO MAKE SURE IT IS AVAILABLE. THIS BIKE COMES NICELY EQUIPPED WITH AN URBAN PACKAGE WHICH INCLUDES VANCE & HINES SLIP-ONS, A RIGHT HAND WAXED COTTON PANNIER, A CLEAR FLY SCREEN, AND A RIBBED BENCH SEAT.